Willem Einthoven found the beat and built a machine that could measure the electrical current a heart creates. It weighed 600 pounds. An electrocardiogram — called informally an ECG or EKG — measures the small electric waves that a human heart creates. It’s been doing it for more than a century. And as heart disease remains a leading cause of death today, it continues to be one of the most commonly used tests in modern medicine. Dutch scientist Willem Einthoven, who won a Nobel Prize for crafting the medical tech masterwork, was building on a long history of tracking heartbeats that began in the late 1700s. A turning point came in 1872, when Gabriel Lippman came up with a gadget called a capillary electrometer, which could measure the voltage changes on the body’s surface produced by the pulses of the heart. A.D. Waller, using Lippman’s invention, captured the first actual measurement of a heart’s beating in 1887. The things these worthy predecessors didn’t account for were inertia and friction inside the capillaries, so their recordings were imperfect at best. Willem Einthoven fixed that beginning in 1901. At first he used mathematical equations to hand-correct imprecisions in the now-familiar valleys and peaks made on photographic paper by the machine’s movements. Within a few years, he bettered the process by coming up with the string galvanometer (on table, at center), which automatically did the corrections for him. The 12-lead ECG machine is standard today, measuring the heart’s electrical signals from 12 different angles. The electrical pulse that spurs a heart muscle’s contraction — or beat — starts at the top of the organ and spreads downward. Einthoven attached electrodes to both arms and the left leg, an arrangement later called Einthoven's triangle, to capture the path of the electric current from the upper right quadrant to the lower left. The first electrodes were vessels filled with saline that bathed each of the parts of the triangle, which meant, in short, patients had to dip their hands and foot into buckets (see above). First used to study arrhythmias, by 1909, ECG’s had clinically diagnosed irregular heartbeats. A year later, they were being used to find the high rounded plateaus suggestive of a heart attack. Within two decades, ECG’s were the go-to test to distinguish if chest pain was originating in the heart or not, and exactly what was going on in the heart to cause that pain. 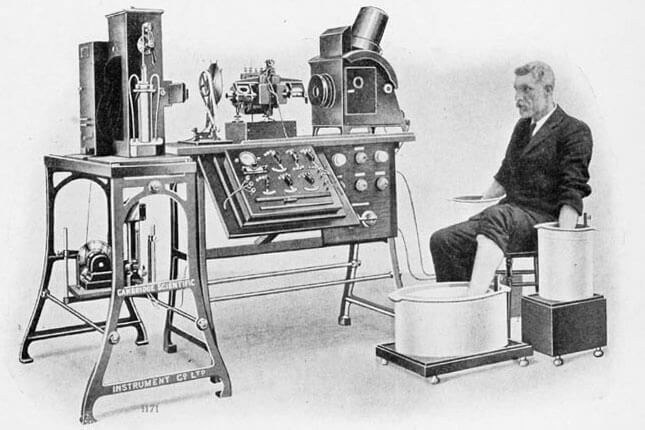 Cambridge Scientific Instrument Company of London — co-founded in 1881 by Charles Darwin’s youngest son, Horace — constructed the first table model of Einthoven’s electrocardiogram in 1911(above). It weighed a whopping 600 pounds and took five people to operate. Over the intervening century the machine lost a considerable amount of weight, but not clinical heft. The modern ECG clocks in at just 8 pounds and remains the gold standard for never missing a beat.